Every year in February, a reenactment of this battle takes place. I got the following information from their website. There isn’t much to see at the battlefield. It isn’t maintained except for the reenactment. Union troops began invading SC on February 1, 1865, with one wing of Sherman's Army headed toward Augusta and the Confederate Powder Works, which was producing most of the Confederacy's gunpowder. The other wing of the army was heading toward Charleston. Thus, the Confederacy was not sure if Augusta or Charleston would be hit next. In fact, Sherman's real plan was to attack Columbia. One of the Union commanders was Major General Kilpatrick. Kilpatrick turned his attention to the railroad. The railroad had been transporting Confederate troops during the war and Kilpatrick went to nearby Blackville and began tearing up track. On February 8, Kilpatrick entered Aiken County and began fighting with the Confederacy at the Battle of Aiken. At this point, near the end of the war, the Confederacy was in bad shape. Many outfits were comprised of young boys and old men. The Confederacy desperately wanted to protect the Powder Works and the Graniteville Mill. Major General Wheeler hoped Kilpatrick would go after retreating Confederates, allowing Wheeler's men to sneak up behind and attack the upper flanks of Kilpatrick's "V". Kilpatrick and his men were finally forced to retreat. On February 12, Kilpatrick surrendered. Coming at the end of the war in the midst of the Confederate defeat, the Battle of Aiken was just a minor skirmish not mentioned in most histories of the war. The Confederate victory is, however crucial to the local history of the region because the victory prevented the destruction of the local capital and economy, enabling the region to withstand the Reconstruction period better than other more devastated areas of the South. Ironically, post war Aiken would quickly welcome Northerners back as it became first a health resort, then a grand winter sporting resort for the Northern elite. In my previous post I mentioned that the Winter Colony folks brought their thoroughbreds with them by train to spend the winters in Aiken. The Aiken Thoroughbred Racing Hall of Fame was established to exhibit Aiken’s role in thoroughbred racing. Forty Champion Thoroughbreds have trained at the Aiken Training Track. All of them are immortalized in the Hall of Fame. This includes both flat racers and steeplechase horses from 1942 through the present. The Hall of Fame is located in the an old Carriage House built in 1902 at Hopelands Gardens. Their grand opening was in 1977. I have to admit, I don’t know much about horses. I sometimes watch the Kentucky Derby and maybe the other two races but that’s about it. The Hall of Fame had pictures of each of the horses, newspaper articles about their wins and the jockey’s jersey showing their colors. Lots of trophies have been donated to the Hall of Fame. I personally enjoyed the posters they had for the children. They gave me some basic understanding of a thoroughbred. Hopelands Gardens must be absolutely breath taking in the spring but are not near as colorful this time of year. Horses are a big deal here in Aiken. Lots of money involved and it shows in the huge mansions all around town. Aiken is a very interesting place to visit. Even Jim found a steed to ride. 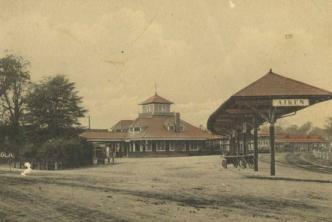 The original depot was build in 1899. New York socialites Thomas and Louise Hitchcock spent the colder months in Aiken and Mr. Hitchcock recognized Aiken was the ideal place to train young thoroughbred horses because the ground never froze and the sand/clay soil provided the perfect footing for the fragile ankles of young horses. In 1892 they built a thoroughbred training center, the first four holes of Palmetto Golf Club and began putting together land for fox hunting. The original snowbirds (actually called Winter Colony) started arriving in great numbers. The need for a larger depot became obvious and in 1899 the new depot became a reality. The original building was demolished by the railroad in 1954 when passenger travel to Aiken ceased. Using the original drawings the architect replicated the exterior of the original depot but altered the interior to satisfy modern construction requirements. The depot/visitor center reopened in 2010. I used a picture from the depot’s website to show the new building. The Train Museum, located on the second floor, has nine dioramas that depict the towns along the original South Carolina Canal and Railroad Company right of way. This railroad became the first designed steam powered commercial railroad in the United States and the longest railroad in the world at that time. I loved the idea that this museum gave us lots of little known facts about trains. There are over 625,000 miles of track in the world which is enough to go around the earth 25 times. Before Refrigerated railcars, trains delivered milk to big cities early in the morning to avoid the heat. That’s where we get the term “milk run”. Steam heat and electric lights were used in train cars for the first time in 1887. Branchville, SC is home to the first railroad junction in the world. The earliest rails were made from wood covered with an iron cap. Steel rails came into use in the 1870s. When locomotives were invented, people worried that the human body could not survive speeds over 30 mph. The Aiken Special – Between the 1880s and 1960, so many northern aristocrats were part of the Winter Colony that they ran the Aiken Special in the Autumn and Spring. Horses traveled in special horse cars that were attached to the Aiken Special. Did you know that Bisquick got it’s start on a train? In 1930, the dining car was closed and a General Mills salesman was hungry. He asked the train’s chef if he could make him something quick and easy. The chef served him a plate of piping hot biscuits. When he asked the chef how he could produce them so quickly, the chef revealed his secret – a premixed blend of lard, baking powder, flour and salt that he stored in an ice box. When the salesman returned to General Mills, he took the idea to a food scientist and Bisquick was introduced in 1931. You can also thank trains for our time zones. During the late 1800s, the railroads maintained many different time zones. Operators of the new lines needed a new time plan that would offer a uniform train schedule for departures and arrivals. Four standard time zones for the continental US were introduced on November 18, 1883. This was a really interesting little museum to visit and we really enjoyed it. One last stop to see cars at the Backin’ Up Classics Morrison Motorcar Museum. Jim enjoyed this place but said it is so full of stuff that you can’t really see the cars. How about a love seat in a Cadillac El Dorado rumble seat? 1960 Ford Fairlane that they just sold for $49,900. This 1941 Chevrolet originally sold for $983.20. I’m sure it’s worth a whole lot more today. A good lookin’ old car. We still have one more NASCAR adventure ahead of us but not til we get to Atlanta. The Hall of Fame is located in downtown Charlotte – at least I think it was downtown. There was a whole lot of traffic and I saw several guys in suits and ties riding electric scooters all over the place. Jim continued to take lots of pictures like I asked him to. So if you are tired of looking at cars you might want to skip this post and the next one. Dale Earnhardt, Jr.’s famous No. 88 Chevrolet. There were two buses of munchkins but they were herded into the theater so Jim was able to stay ahead of them and watch the movie at the end of the tour. Racing simulators give visitors a driver’s experience and perspective on race day. Since Jim has actually driven several race cars, he didn’t spend any time on the simulators. The following cars are all found on Glory Road. 1952 Hudson Hornet -In late 1951, Tim Flock drove the No. 91 Hudson and in his first race won at Lakewood Speedway in Atlanta. In 1952, Flock won eight times in the No. 91 to capture his first of two NASCAR premier series championships. 1957 Ford Fairlane – in 1957, Fireball Roberts drove this car to eight victories. It was known as a “zipper top” for its removable hardtop. 1964 Plymouth Belvedere – With 200 wins, Richard Petty is the undisputed “King of NASCAR”. He started his career in 1958 and in 1964 he captured his first of seven Daytona 500 victories and first of seven championships in his HEMI-powered Plymouth. 1966 Ford Galaxie – As one of the few African Americans to compete in NASCAR’s highest level during the 1960s, Wendell Scott faced many challenges. Using secondhand parts and also serving as car owner, crew chief and mechanic, he still managed to win against better funded teams. In 1963 he became the first African American to win a NASCAR premier series race. 1966 Dodge Charger – Driver David Pearson started driving the Charger in 1963. In 1966 the sloped back roofline provided an aerodynamic advantage and ushered in a new era of race cars. Pearson won 15 races and the championship that year. 1939 Chevrolet Coupe – Driven in 1970-1971. Richie Evans’ career took off behind the wheel of this car which he ran on shorts tracks. He was known as the Rapid Roman because he came from Rome, NY. 1976 – Chevrolet Monte Carlo – This car was dubbed “Bertha” by her driver Darrell Waltrip. He took the wheel in 1976 and remained successful for five seasons. 1987 Ford Thunderbird – In 1987 Davey Allison had five poles and two wins to make him Rookie of the Year. 1991 Oldsmobile Cutlass – Green is considered to be an unlucky color for drivers (sorry Michaela) the green No. 33 Skoal helped “handsome” Harry Gant to victory lane 18 times. When I met Jim he was dating two Carols. One of them was Harry Gant’s niece. 1992 Ford Thunderbird – This car was driven by Bill Elliott known as Awesome Bill from Dawsonville. His son Chase is currently driving the No. 9 Chevrolet. 1999 Chevrolet Monte Carlo – Richard Childress became the first owner to feature a limited-edition paint scheme. In 1999 Dale Earnhardt drove the Wrangler No. 3 Chevrolet in the all-star race. 2005 Chevrolet Monte Carlo – Jeff Gordon drove the colorful Monte Carlo and his crew became known as the Rainbow Warriors. 2013 Chevrolet SS – Jimmie Johnson won the championship seven times tying him with Richard Petty and Dale Earnhardt Sr.
2015 Toyota Camry – Kyle Busch won the first premier series title for Toyota in the M and M car.